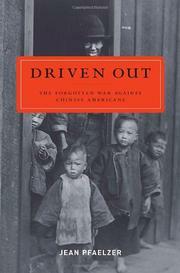 For the last half of the 19th century, Americans mounted an ecumenical campaign to expel Chinese immigrants, as this far-ranging, disturbing book chronicles. Pfaelzer (English/Univ. of Delaware) taught for many years in Eureka, in northernmost California, where on arriving she remarked on the absence of Asian American students. “I was told,” she writes, “that Chinese parents would not send their kids to HSU because ninety years earlier all the Chinese had been driven from Eureka.” The grim campaign of 1885 was little documented, as were similar episodes up and down the Pacific Coast. The drive against the Chinese began almost the moment that Chinese arrived to work in the gold fields of California, she writes; though threatened and badly outnumbered, the Chinese refused to abandon their claims, and violence ensued, despite the efforts of local heroes such as the fair-minded, Kentucky-born Sheriff Clay Stockton. Chinese importers of labor continued to deliver workers to the railroads and lumberyards, while other workers established restaurants and laundries; though their work was needed, these men without women were also feared and despised. The campaign of pai hua, or “Driven Out,” intensified long after the gold rush, when unemployed whites began to arrive in the Northwest in number and demand their share of the economy; even African Americans participated, while in San Francisco, the Anti-Coolie League met every Friday at the local B’nai B’rith chapter. Against them, as Pfaelzer writes, the threatened Chinese resisted, mostly by legal means and even within the legal system, while some white politicians attempted to persuade vigilantes to “deprecate all violence or undue force in the expulsion of the Chinese as inviting the interference of the Federal Courts.” The violence continued, however, to the point that the government of China was finally moved to protest, to little avail. Too few Americans have any idea that these events mark the nation’s past. Pfaelzer capably reconstructs a shameful history.